The hottest ticket in town just got more expensive. 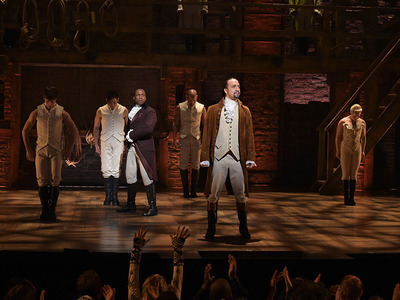 “Hamilton” is raising the price of its premium seats from $549 to $849, but the musical has simultaneously increased the number of $10 lottery tickets it has available. With the price hike, the show has shattered records to become the most expensive ticket on Broadway ever by a landslide. “The Book of Mormon” previously held the record at $477. “Hamilton” is sold out through January 2017 but began a presale for select American Express cardholders for January 31 to May 21. General sale to the public begins June 12, 10 minutes after the Tony Awards are scheduled to end. Thanks to the presale, the regular seating already seems to be entirely sold out for those four months. But rise up, there’s still a glimmer of hope. Also included in that next four-month block is an increase in the number of $10 lottery tickets available, from the current 21 to 46. These seats are located in the theatre’s first two rows, and thousands of people try to snag them every day online. In the meantime, you can rewatch the “Hamilton” performance from the Grammys and pretend like you are at the Richard Rodgers Theatre.